So I took Dawn's project challenge over on Paper Wings to make a card from the recent Spring Supplement from TAC. This time around they included projects that you can cut out of the supplement to keep for use later. This one was for a cute little circle envelope with a card in it. the concept is easy make a circle and then fold up it almost in half, then fold the two sides in. The size of the card will depend on the size of the circle, mine was roughly a 6 1/2" circle. I ended up using the envelope for a gift card holder for my mom's birthday. So my circle envelope turned out to be the perfect size for that! 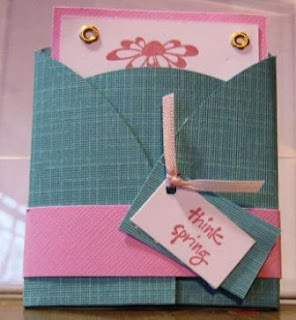 In any case these are clever little envelopes that could be made lots of different ways and sizes. If you want more details just drop me an email! que bella me facino y me encanto todos los trabajos!! It does look great - very novel! Nice work Angie - like the colours you chose! 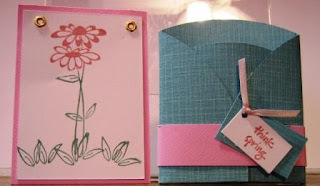 Beautiful card, great Blog, wanted to say hello to one of my blogging sister's and my introduction is on my blog. I look forward to being inspired and hopefully inspiring you too!